Prayers and offerings to ancestors and the Heaven. Birthday of Ji Gong. An immortal who is said to bring wealth and good luck. Taoist celebrate the birthday of the Sun deity and of our sun. Prayers to the deity of the guardian of women. This day was said to be the day human beings were created by Pan Gu, an ancestor of the ancient Chinese. Birthday of Cereal Emperor who grants longevity. Birthday of Jade Emperor or Heaven God (Tian Gong). The supreme deity. Earth God or Di Gong Festival. Birthday of God of Wealth. The Lantern Festival and the end of Chinese New Year. Birthday of the Heaven Emperor: Ziwei. The Emperor grants blessings. This day is known as the Superior principles day commemorating Heaven, Earth and Water. Shui Jing Festival for farmers. Celebration for the two Door Gods to ensure protection for family and success for the coming year. Feast of Qui Chuji is to commemorate Qiu who was considered the father of jade by craftsmen in the jade trade in China. Festival of the Sun. On this day, the sun visits the Jade Emperor to discuss the coming year. Birthday of local Earth God who is worshipped at home. Birthday of famous Confucian philosopher Mencius. Birthday of Literature God who was recognized as a god in the Shang Dynasty. Birthday of the Eastern Mountain God. He reigns over Mount Tai. Temples known as Eastern Mountain Temples or Heaven Equaling Temple were set up to honor him. Birthday of the Ruler of the Third Court of Hell. This hell is meant for unfilial sons and ministers. Birthday of earth spirits related to agriculture. Celebrated by farmers. Birthday of God of Fishermen and the sea (known as Hong Sheng). Celebrated by fisherman who hold operas and feasts. Birthday of Lao Tzi, the revered founder of Taoism. Birthday of the Ruler of the Fourth Court of Hell. This hell is meant for swindlers and cheats. Birthday of Goddess of Mercy (Guan Yin). Birthday of Bodhisattva Buddha (Tu Sha). Celebration of everyone in the Palace of Heaven. Birthday of the Ruler of the Second Court of Hell. This hell is meant for the condemned. Birthday of the great Taoist deity Demon-Exorcizing Heavenly Judge: Xuan Wu. His duty was to determine the life-span of each person. Birthday of the Guardian of the North. Birthday of the secretary to the Jade Emperor. Birthday of Zhang Lao. Day for remembering the elderly. Birthday of the Ruler of the Sixth Court of Hell. This hell is meant for go against Heaven, earth or the Northern star). Birthday of the Five Spirits for Fate and Destiny. Birthday of God of Medicine. Birthday of Lightning Goddess or Lightning Mother. Birthday of the god of Central Mountain or Middle Mount Song. Birthday of the Heavenly Queen: Ma Zhu. People often relate seeing a lady in red flying above the sea to rescue those who are in danger of drowning. The Heavenly Palace in Beigang, Taiwan is dedicated to her. On this day, many followers worship her. Birthday of Immortal General Ji. Birthday of the legendary emperor who invented writing. Birthday of the Star of Longevity or Shou. A fictional figure associated with respect for the elderly and aged. 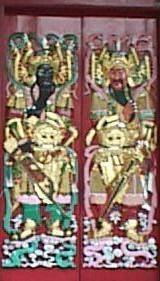 He appears together with the two deities Fu (Luck) and Lu (Prosperity). Day of sacrifice to the Earth. Birthday of the Mother of Sea Dragon. She associated with protecting children from disasters and those at sea. Birthday of one of the gods of the Five Directions. Birthday of the son of Tai San (Mountain God). Birthday of the son of God of War (Guan Ti). Revered by students of martial arts. Martial arts displays and feasting is done on this day. Festival of the union of Heaven and Earth and the creation of the universe. Birthday of Buddha, when he assumed human form on earth. Birthday of Royal Mother. The head goddess of all the immortals. Associated with long life. Birthday of the Guardian Buddha of the Song Dynasty. He has a red face, a beard and protruding teeth. He guarded the Heavenly Jade Palace. He is associated with protecting the common people. Birthday of Tai San (Mountain God). Birthday of Liu Haichan. One of the Eight Immortals. His original name was Liu Cao. Birthday of wells and streams. Birthday of Master Lu Ban, the Skilled deity. Offerings to him whenever a new foundation for a new building begins. Second birthday of Guan Yin. This date is to commemorate the conferring of Bodhisattva on her due to her earlier postponement to save human suffering. Birthday of the King of Horses. Birthday of the God of War (Guan Ti). Birthday of the Fire God. Birthday of Er Lang. The second son of an Indian king. He was a military (fighting) god who was the only person who could subdue the Monkey god when on one in Heaven could. He holds a magic pagoda in his hand. Birthday of the deity of the Great Bear star constellation. Birthday of Tai Shang Lao Jun. His figurine can be found in most Taoist temples. He is a distinguished thinker. He is revered as he is considered one of the most supreme sage and is popularly worshipped till this day. Double 7 is considered the most dangerous day of the year. The day when the gates of hell are opened for ghosts to roam the earth. Weddings, moving house and (external) outings are avoided. Birthday of Taoist Immortal Changchun. Also known as Qiu Chuji. He was the founder of the Longmen Taoist Martial Arts School during the Yuan Dynasty. Celebration and Festival of the three Taoist principles. Birthday of Wang Mu Niang Niang or Queen Mother of Heaven. Festival of the guardian deity in-charge for the year. The guardian is in-charge of both life and death for the year. Birthday of the guardian of Palace of Kings. He helps the poor or the needy to seek an audience with the King. Birthday of the God of Fortune. Birthday of the God of the local city. (Less important than the Birthday of the God of the City on the 13th Day of the 5th Month. Birthday of the King of the Dark World. He is the person who opened the gate of hell on the first day of the 7th month. People would pray to him if they suffered from illness during the 7th month. Birthday of the Savior of the Dead. His picture is burned during funerals to help ease the passage of death for those sent to `hell'. Birthday of the god of Dragon Slayer. Birthday of the god of Golden Armour. Birthday of the Village God. A lesser ranking god than the City God. Birthday of the Kitchen God. He would report to the Jade Emperor on the 24th of the 12th Lunar month. Birthday of the Thunder God. He is the god in charge of thunder and upheld justice. Birthday of the Emperor of North Mountain. He reigns at the North Mount Heng. Birthday of the moon. On this day the moon is at the brightest in the Northern hemisphere. Birthday of the Monkey God. His exploits are featured in the novel, Journey to the West. Birthday of the recarnate of Guatama Buddha. Birthday of the God of Wealth and Pleasure. Birthday of the Heavenly Queen of the Dipper constellation. Festival to commemorate the God of War becoming an immortal. Birthday of one of four Dragon Kings. (North, South, East and West). Birthday of the Sage of Writing. Celebration of Goddess of Mercy becoming a Bodhisattva. Birthday of the Protector of Fire. Festival of remembrance of the dead. Birthday of the King of the East or Mu Gong. His wife, rules the West. Both of them are revered Taoist deities. Birthday of Wise Immortal Cao. Birthday of Bodhidharma. The founder of Japanese Zen Buddhism. Birthday of one of the Emperors of the Five Mountains. Birthday of the deity of smallpox. Birthday of the Three Principles. Birthday of the deity of Marriage. Festival of the North Pole Star. Birthday of the Emperor of the Western Mountain. Celebration of the Jade Emperor as the Supreme leader. Birthday of Bodhisattva who relieves suffering. Birthday of the great Buddha. It is a time of repentance. Festival of the Nine Lotus Leaves controlled by the Goddess of Mercy, Guan Yin. Birthday of Zhang Guo or Zhang Guo Lao. One of the Eight Immortals who lived in the Tang Dynasty. His picture is often placed above the bed of newly married couples.